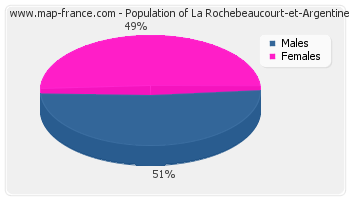 Population of La Rochebeaucourt-et-Argentine was 398 inhabitants in 2007. You will find below a series of charts and statistical curves of population census of the town of La Rochebeaucourt-et-Argentine. Population of La Rochebeaucourt-et-Argentine was 397 inhabitants in 1999, 424 inhabitants in 1990, 411 inhabitants in 1982, 408 inhabitants in 1975 and 459 inhabitants in 1968. Area of La Rochebeaucourt-et-Argentine is 17,31 km² and has a population density of 22,99 inhabs/km². Must see: housing of La Rochebeaucourt-et-Argentine, the road map of La Rochebeaucourt-et-Argentine, the photos of La Rochebeaucourt-et-Argentine, the map of La Rochebeaucourt-et-Argentine. I like La Rochebeaucourt-et-Argentine ! Population of La Rochebeaucourt-et-Argentine was 398 inhabitants in 2007, 397 inhabitants in 1999, 424 inhabitants in 1990, 411 inhabitants in 1982, 408 inhabitants in 1975 and 459 inhabitants in 1968. This population Census of the town of La Rochebeaucourt-et-Argentine was made without duplicated data, which means that each La Rochebeaucourt-et-Argentine resident that have ties to another municipality is counted only once for the two municipalities. This curve shows the history of the population of La Rochebeaucourt-et-Argentine from 1968 to 2007 in cubic interpolation. This provides more precisely the population of the municipality of La Rochebeaucourt-et-Argentine the years where no census has been taken. - From 1999 and 2007 : 25 births and 41 deaths. - From 1990 and 1999 : 21 births and 52 deaths. - From 1982 and 1990 : 34 births and 48 deaths. - From 1975 and 1982 : 27 births and 45 deaths. - From 1968 and 1975 : 28 births and 52 deaths.